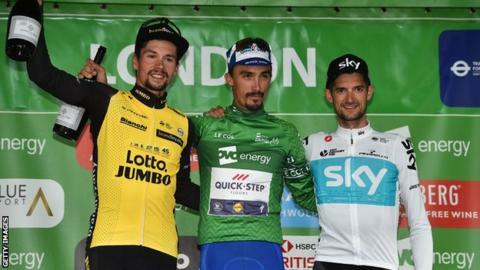 Julian Alaphilippe won the Tour of Britain as Caleb Ewan took sprint victory in Sunday's final stage. Australian Mitchelton-Scott rider Ewan edged out Colombian Fernando Gaviria and German Andre Greipel at the end of a 77km circuit race in central London. French Quick-Step Floors rider Alaphilippe, 26, finished safely in the peloton to preserve his 17-second advantage on Team Sky's Wout Poels. Slovenian rider Primoz Roglic of LottoNL-Jumbo finished third overall. Team Dimension Data's 23-year-old South African Nicholas Dlamini won the King of the Mountains jersey, while New Zealander Patrick Bevin of BMC won the points competition.